One of the things that I have learned in life is that if something is not in writing, it means nothing legally. In better places and times throughout history, a man's word was his bond, and a handshake was as good as a legal contract. Unfortunately, in today's perilous times, if it's not in writing it is worthless! A man is only as good as his word. Psalms 138:2, “I will worship toward thy holy temple, and praise thy name for thy lovingkindness and for thy truth: for thou hast magnified thy word above all thy name.” Paul was a man after Gods own heart, as is every faithful Christian who walks closely with the Lord Jesus Christ! The psalmist, David, said that God has magnified His Word even above His own name. The reason why is obvious, because just as a man's word is his bond, so also is the Lord's. If God were ever to break even one promise, even in the slightest way, He would lose all credibility. Dear reader, God has never, nor will He ever, go back on a single one of His thousands of promises made to man in the Scriptures! A man doesn't live right merely because he is a born-again Christian, but because he walks with God and fears Him. Every believer ought to have a fearful reverence for our heavenly Father. Hebrews 10:31, “It is a fearful thing to fall into the hands of the living God.” The Holy Bible teaches that in eternity every person will be held accountable even for their words. Matthew 12:36, “But I say unto you, That every idle word that men shall speak, they shall give account thereof in the day of judgment.” Any sensible person of faith will wisely take heed to these warnings. We are all living on borrowed time here on earth. If it's not in writing, it means nothing! What a wonderful thing it is, and the grandest blessing of all blessings, that our omnipotent God has put His manifold promises into writing! Titus 1:2, “In hope of eternal life, which God, that cannot lie, promised before the world began.” I have heard countless people throughout my life, express their foolish views regarding life after death, with nothing more to back up their ludicrous beliefs than mere conjecture. One man told me that he believed in reincarnation. I asked what was the basis of this belief. He said that just as a caterpillar morphs into a butterfly, so also does he think that a human being when they die will reincarnate as another life form. Ladies and gentleman, that man is a fool of fools! Would you jump off a tall building simply because you saw a cartoon character do it on television? That is no different or better than what that foolish unsaved man told me! Reincarnation is a lie of the Devil, which doesn't exist, and there is no credible source to justify one's faith in it. Folks, we have God's wonderful promises recorded IN WRITING in the Holy Bible!!! You can take that to the bank! You can count on Jesus! That is what the Bible means in Romans 10:11, “For the scripture saith, Whosoever believeth on him shall not be ashamed.” We see in the Bible that the apostle Peter was ashamed of Jesus, denying that he ever met or knew Him! Peter even cursed the name of Jesus to convince his accusers that he was not a Christian! Peter was so convincing that they left him alone. As far as they were concerned, Peter was just another unsaved reprobate warming his hands around the fire! Yet, we know that Peter lied, and that he was very much a born-again child of God. Clearly, Romans 10:11 is NOT teaching that a saved person won't be ashamed of Jesus. Again in John 12:42-43 we read, “Nevertheless among the chief rulers also many believed on him; but because of the Pharisees they did not confess him, lest they should be put out of the synagogue: For they loved the praise of men more than the praise of God.” The chief rulers were ashamed to tell anyone that they believed on Jesus, for fear of being ridiculed and persecuted by the wicked Pharisees. So what does the Bible mean in Romans 10:11? It refers to a passage in the Old Testament from Isaiah 28:16, “Therefore thus saith the Lord GOD, Behold, I lay in Zion for a foundation a stone, a tried stone, a precious corner stone, a sure foundation: he that believeth shall not make haste.” It wonderfully means that if you put your faith in the Good News (Gospel) of Jesus Christ that the Lord won't let you down! 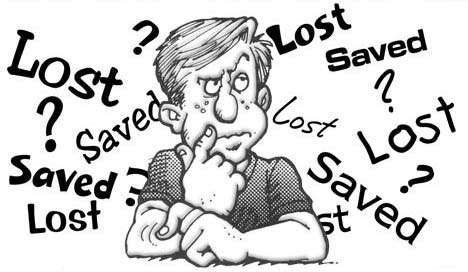 The day will never come when any Christian believer is regretful or sorry for coming to Christ to be saved! Jesus keeps His Word!!! John 6:47, “Verily, verily, I say unto you, He that believeth on me hath everlasting life.” The world is filled with unsaved people who reject Christ's words, refusing to believe on Him as their personal Savior. Sadly, they WILL perish into the eternal fires of Hell when they die! God NEVER sends anybody to Hell, He simply honors your decision to go there! Rejoice Oh Christian, because you have God's promise of eternal life IN WRITING!!! Hallelujah! Praise God! John 11:25-26, “Jesus said unto her, I am the resurrection, and the life: he that believeth in me, though he were dead, yet shall he live: And whosoever liveth and believeth in me shall never die. Believest thou this?” The pronoun “Whosoever” includes you my dear friend! We often talk about the subject of death as humans, because it is a common term that we hear; however, carefully and joyously consider what Jesus said in John 11:26, “And whosoever liveth and believeth in me shall never die. Believest thou this?” Isn't that precious! The Lord Himself put it in writing in His inspired Word, that whosoever believes on Him “SHALL NEVER DIE”! Upon the day or evening, at the very moment, that our physical body of this tabernacle can no longer provide housing for our soul and spirit, there will be no break in our conscience. Our soul and spirit are already alive forevermore! This ole flesh is nothing but a hindrance for us, from which we will one day be gloriously freed. What a day that will be! But I forewarn you dear reader, if you have never been born anew by the Holy Spirit of God, which is through faith in the imputed righteous of God alone, then you have no hope nor expectation, other than to burn in a miserable literal place called Hell, where you will be tormented night and day without rest, relief nor hope for all eternity without end! Please get saved before it is too late. Salvation is absolutely free, and there is NOTHING you must give up except your unwillingness to “Believe on the Lord Jesus Christ” (Acts 16:31b). You have it IN WRITING my friend, from your Maker and Savior, and that means something!! !